Personalized smart lighting, shade, and temperature control for any home, any budget. Added convenience. More comfort. Staying in touch with your home, even when you’re not there. Scheduling — you can program lights and shades to automatically adjust at set times of day. Geofencing — controls lights based on your location. This feature can turn lights on for you when you arrive home and notify you if you’ve left lights on when you leave. Smart Away — randomly turns lights on and off in the evening, so it looks like you’re home, even when you’re not. 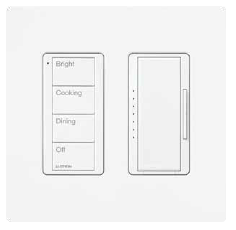 Easily set multiple lights and shades to just the right levels for cooking, a quiet dinner, or cleaning up. System will work with precision and accuracy, free from interference with other frequency bands. Works with dimmable LED bulbs, incandescents and halogens. More reliable dimming performance over standard dimmers when dimming LEDs. Matching aesthetics for a coordinated look throughout your home. Monitor and adjust lights, shades, and temperature on your smart device, whether you’re home or away.